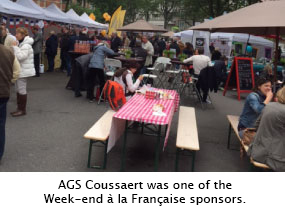 For the third consecutive year, AGS Coussaert sponsored Week-end à la Française (The French Weekend) which took place 4-5th June 2016. During this weekend French and Belgian cultures mingled at the Guy d’Arezzo’s square, in Uccle, Belgium. 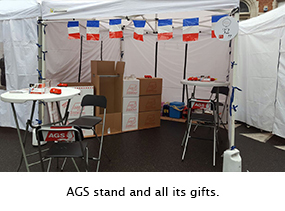 For the third consecutive year, AGS Movers Coussaert sponsored Week-end à la Française (The French Weekend) which took place 4-5th June 2016. During this weekend French and Belgian cultures mingled at the Guy d’Arezzo’s square, in Uccle, Belgium. It was organized by les Petites Puces, which since 2008 has been involved in various events to highlight Brussels and promote craftsmen, designers, artists and tradesmen, as well as the Juliette and Victor’s team, a French-Belgian lifestyle magazine. Over the 2 days, about 60 French-Belgian companies, craftsmen and designers introduced more than 8000 visitors to the passion of their jobs, expertise and services, particularly in the field of gastronomy and fashion. As a French-owned company, AGS Coussaert is also passionate about French culture and supporting local community events. The team offered a friendly welcome and focused on introducing the many visitors to its secure storage services. This year, the focus was on the new fully automated warehouse. The modernism and technological advances in terms of storage put in place by AGS Coussaert had clearly impressed the many visitors. The mild weather and an easy-going atmosphere contributed to making this third year of The French Weekend a complete success. 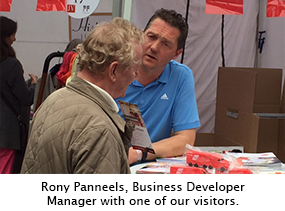 AGS Coussaert had the opportunity to meet with its existing clients as well as to build up new contacts. We are proud to be highly renowned among the large foreign community living in Brussels for our international removals and secure secure storage services. The event has become a key part of the social calendar for the foreign and local community living in Uccle, and the AGS Coussaert team is delighted to already confirm its participation in the 2017 edition!